Doodling around with some older photos, I found this one from last year that I like. From a compositional point of view, there are things that caught my eye this time around. I liked the lines where the water changes color and the diagonal of the trees rising left to rise set against the tallest peak rising right to left. That works. 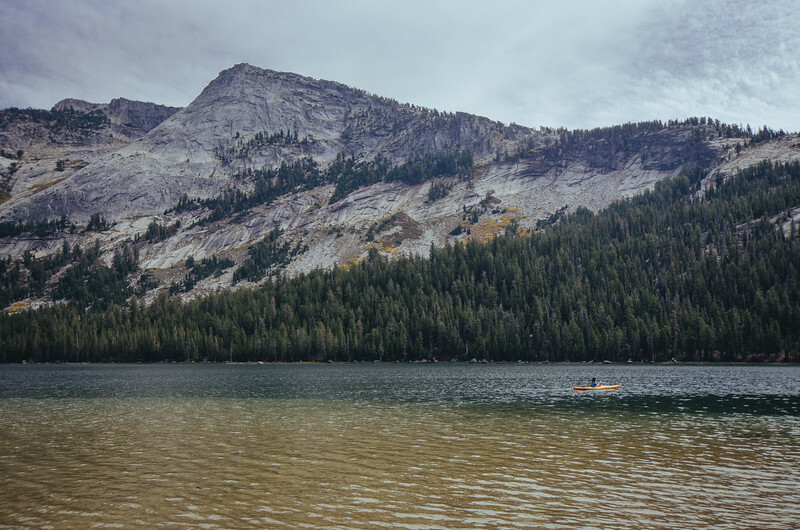 I like the kayak being small -- it shows the immensity of the landscape. This is a place a person can go be humbled. Some people may take issue with the kayak traveling left to right AND being on the right side of the image. This violates the conventional wisdom that calls for more space in front of the direction of travel. I think I get away with it here because the kayak is so small; it's not really the focus of the image. It's a way to show scale. A tighter view of the kayak would almost certainly need more space in front of it. Camera & Settings: Nikon D5100 and a Nikon DX 10-24 wide angle lens at 24mm. Nothing fancy about the camera settings; I shot at f/8. I shot in RAW and processed in Lightroom using VSCO slide film preset tools.